Registration is now open for the USTA Florida Campus Championship, to be held in Altamonte Springs on Feb. 19-20, 2011. The deadline to register is Feb. 4, and all Florida colleges and universities are welcome to enter. "Start organizing now, because all Florida teams and schools are welcome," says USTA Florida Team Tennis Coordinator Michelle Willis. "Even if you do not have an official club, you can put a team together for the Campus Championship. 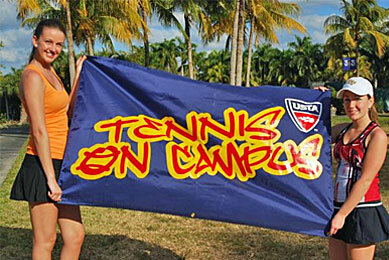 Your school can participate in the Campus Championship even if you haven't played in a Tennis on Campus series event." The cost is $125 per team, and teams must have a minimum of two men and two women. The registration fee does not include hotel. Register now, as the event will be capped at 30 teams. All teams must submit a roster when registering, and post-registration roster change requests can be e-mailed to willis@florida.usta.com. "If you are registering more than one team for your school, your "A" team will get in for sure," Willis says. "We reserve the right to 'wait list' additional teams to accommodate unique school entries. Be sure to specify which team you are registering -- example: "A" team, "B" team, etc." To register or for more information go to http://www.regonline.com/Register/Checkin.aspx?EventID=926705. 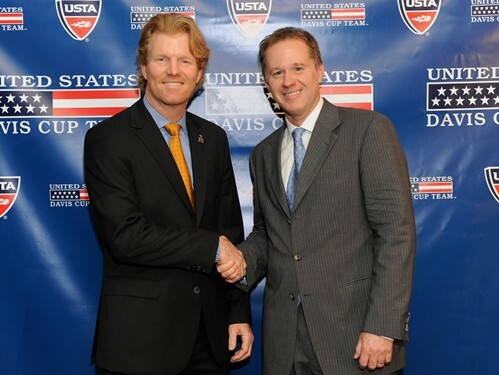 U.S. Davis Cup Captain Jim Courier spoke to the media on a conference call this week ahead of his debut as captain in the first round of the 2011 Davis Cup, when the U.S. travels to Chile for the March opener. "I took the opportunity in December to travel around the United States and get a chance to visit with our players when they were training in the off-season. I got to go to Los Angeles, spend some time with Sam Querrey and Mardy Fish and Donald Young Jr. out in Carson [Calif.]. Went down to Tampa, where John Isner and Mike Bryan were. Bob fortunately for him was away on his honeymoon, having just been married. I got to Austin, Texas, to see Andy Roddick and Ryan Harrison, who was practicing with Andy the day I was there. I got to see those guys in a lower-pressure environment and spend some time with them and just try and establish those working relationships with the players I know a little bit less." "I think he's in the best shape physically and mentally tennis-wise he's been in since last March when he had a terrific U.S. hardcourt season, got to the ATP Masters finals in Indian Wells and won in Key Biscayne. He didn't play for a while after that due to a scheduling choice, then got ill over in Europe. We would later find out he had a form of mono. I don't think physically he was where he needed to be, and of course that impacts your game in all kinds of different ways. He's finally had that off-season to get his body right. Andy is a total pro. He doesn't leave anything to chance as far as preparation goes." "It will be disappointing not to see [Chile's Fernando Gonzalez, who is injured] down there as a member of the team. But we know we're going to have a difficult match, whoever is playing, whether it's Nicolas Massu, Paul Capdeville, [Jorge] Aguilar, whoever is chosen to play for the squad will play with passion no doubt. All of us who have ever played in Davis Cup matches away understand that nothing can be taken for granted and you have to bring your best team and tennis to win." "Both Mike and Bob are excited about Davis Cup. They're passionate. They're Davis Cup warriors. I expect them to be a big part of what we do together as a team here in the years to come. But we're not naming the team today. I unfortunately can't give you any information on who will be in Santiago with the team. But in due time we will name the squad and look forward to being there." "Mardy needs matches. He only got a couple matches in in Brisbane. I'm not sure if he's going to get any match play this week. He'll be well-rested and very fit because he had a longer off-season than most. Obviously we saw what his fitness level did for him last season. He's there again. As far as his weight, it's right where he wants it to be. He's added a little bit of leg muscle. That's what he was in the process of doing when I was with him in Carson in early December. Now it's just a question of getting that match confidence back." "Sam had a good off-season, was working very hard in Carson on his fitness. I think he's gotten his body fat down to a low level. He's probably as fit as he's ever been. And he has weaponry. Sam is a guy who to this point has underachieved in the majors and Masters Series. He doesn't need me, you or anybody else to tell him that. It's time for him to step up into those moments and play the type of tennis he plays in the 250s in the bigger tournaments. That's the next step for him and I think he's ready to take it. His off-season has put him in position to feel like he's done the work and has earned it. I'm looking forward to see how he comes out of the blocks." "Isner had a little bit of an interesting off-season. He had a few little injuries. He also practices a little differently than most of the players. He likes to do more off-court training and doesn't hit quite as much. Let's be clear, his style of play is never going to be a grinding style. He seems to know what he needs to do to get prepared and play well. He had a nice start to the season in Perth getting the matches that he needs there...John, he's probably the least popular player to play on tour, I would believe. No one wants to see that serve, then he's got the forehand coming...I think the only thing I've seen that really surprised me so far was how John Isner trains, which is just very foreign to me to not feel like you hit balls to be ready. He's a guy who I do relate to in the fact that he loves the matches, he gets up for those, and practice doesn't matter to him as far as results go. He has a different philosophy. I'll spend more time with John. He's traveling with Craig Boynton, who used to travel with me. I have a great source of information through Craig to understand him a little bit better." "I was very heartened to see that Donald made the commitment to go out to Carson and spend some time training out there with Mardy and with Sam and with Rodney (Marshall), who is the strength and conditioning coach for the USTA Player Development Program. That's one of the areas where Donald really needs to lift, is in the fitness area. He has so much upside potential. He really is a terrific striker of the ball. He's leaving a lot on the table because he hasn't been in great shape. He also just hasn't made that jump from a ball-striker to a tennis player. I'm hopeful that he'll keep the level of commitment that he showed by being out there on his own for a couple of weeks. If he can keep that up and keep the training and keep pushing forward and take his knocks, he's without a doubt a Top 50 player. It would be a real waste if he didn't reach that at a minimum. He has a lot higher potential than that. But you can't get there without the work. I don't care how gifted you are, you talk to the guys in the Top 10 and ask them what they do. None of them sit around. They're all grinding and getting the most out of their games. Donald has to continue on in the vein that he was going in early December. So I'm hopeful that he can still reach his potential, because it would be a real shame." "Ryan Harrison, on the other side of that coin, has a huge work ethic already and is firmly committed to exploring all the angles to try to find his best tennis. He's still young. He's still raw. But he's going to get there. What 'there' is we don't know. We don't know what the top in potential is there because there are a lot of factors, not just the physical ones, but the mental ones, how do you deal with pressure once you get to a certain level. You can only find out once a player gets there. He's a great raw talent. He's a great worker. He wants it very, very badly. So that's really positive." "I certainly have claycourt experience growing up in Florida, playing a lot of my tennis on the green clay, the Har-Tru. I think that helped my development as a player. I think Patrick (McEnroe) and the USTA Player Development Program is also pushing to have our players spend more time practicing on the surface. I think it's important for the younger players to get past any fear factor or discomfort of switching surfaces, which we used to do when I was at Bollettieri's. Sometimes we would play on three surfaces in one afternoon, start on a hardcourt, move to a claycourt, and then finish indoors on carpet, never changing any shoes, never making any adjustments other than sliding versus stopping. I think it's critical for players not have a fear of the surface and also understand the patience required...One of the things that I think is an easy mistake for players to make when switching surfaces is to overemphasize the switch and to go away from what they do best and maybe allow the surface to dictate to them as opposed to forcing the surface to bend to their will." "James is definitely available. We've been in touch. We were supposed to see each other in Tampa when I was down there with John Isner and Mike Bryan, but he ended up playing in an exhibition in Argentina that week so we missed. James is certainly on my radar. He's certainly working his way back and hoping to break back into the conversation. It's going to come down to health for James. We've all seen how capable he is of playing big tennis when he's healthy. But that health has really escaped him in the past year or so. It's certainly my hope he can get back on that path and make himself part of the conversation."